Sometimes art imitates life. This is fairly obvious, as “based on a true story” appears as a tagline on books and movies all the time. The reverse is also true, according to Oscar Wilde, who said in 1889’s The Decay of Lying that, “Life imitates Art far more than Art imitates Life.” Legitimate arguments can be made for both sides. But for this holiday season at ENA, art imitates art. Each year we send a holiday card to our clients and friends and its pretty standard. Best wishes, card, envelope, post office, done. But this year, after watching The Official Lyric Video for Green Day’s Bang Bang, we challenged the art department to create something more dynamic. The collage style motion graphics was one that we thought might lend itself to a fun and different video greeting that we could use to wish merry holidays to our list of the naughty and nice alike. After a few weeks of video creation and a lengthy search for music that was both appropriate and cool enough to fit the bill, a video holiday card was finally born. The result was extremely cool and we’re happy to share it, and the sentiment for season’s greetings, with everyone here as well. 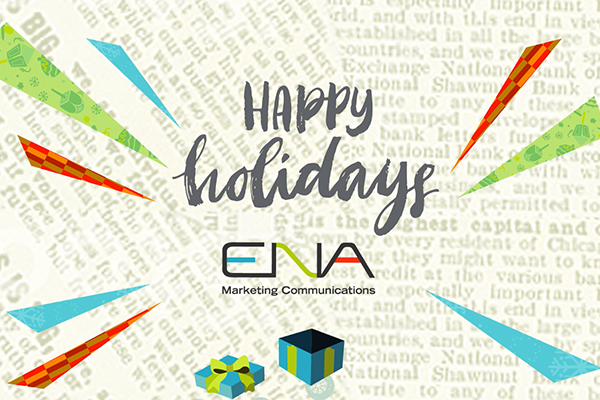 From our team to each of you, we hope you have a bright and happy holiday season.